Chris Chatterton, chief operating officer at the Methanol Institute, looks beyond 2020. It is a truism in shipping that investors and operators build assets for the long term but must take a short term view of the markets in which they will operate. Seen in this context, the 2020 fuel switch, while important and potentially painful, is the start of the conversation, not its end. The shipping industry is rightly focused on the short term impact of the 2020 global sulfur cap. The likely effects of this piece of regulation extend beyond its intended environmental goals to impact refining capacity, supply and demand – and thus the tanker markets – as well as having potential implications for vessel operations. Despite being shrouded in the fog of often contradictory news reporting, opinion and analysis, we can comfortably assume that bunker prices will rise into 2020, whether for gasoil or low sulfur fuel oil. We can also see shortages and pinch points where supply and demand are out of step. 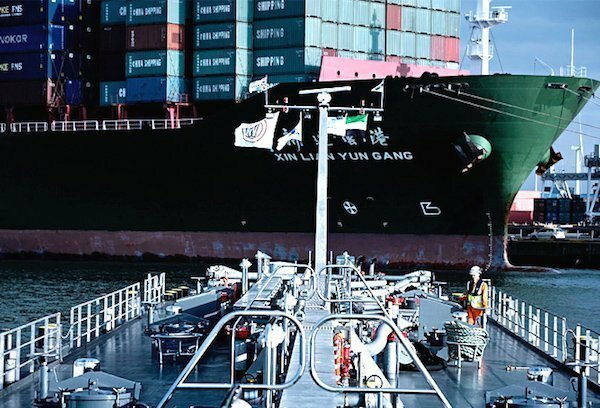 The operational/compliance/enforcement-related impacts are less clear but while IMO has pushed the agenda by banning the carriage of HSFO as fuel on vessels without a scrubber fitted, there may be problems for owners who adopted a wait-and-see approach. In the past, owners have tended to go where the bunkers are low cost – even if that means some risk to quality – but given the supply position, it seems less likely that they will be able to source LSFO or gasoil without having long term agreements in place. How long the squeeze persists is anyone’s guess – though the refiners will be looking to manage their risk as well as taking the opportunity to control supply of compliant fuel so as to shorten payback on their investments. Even after supply/demand normalises, the post-2020 era will be one of higher fuel prices, changes that make alternatives more attractive to owners planning for newbuildings in the next few years. From March 1 this year, all vessels trading globally must report their fuel consumption in line with the IMO’s Data Collection System, information which will be used to formulate its longer term plans to tackle climate change. From March 1 they must do the same for the IMO Data Collection System. In January 2021, the North Sea and Baltic Sea Nitrogen Emission Control Areas will take effect, putting further pressure on permissible emissions of NOx from shipping in these areas. By 2023, the IMO will have set out its carbon strategy, at which point the options for the industry are likely to become even tighter – pay a levy for continuing to use fossil fuels or adopt alternatives that offer a cleaner long term solution. A sustained high price for LSFO or marine gasoil, especially when the cost of a carbon tax is added, might be a boost to LNG but could also make methanol competitive as a marine fuel for newbuildings and conversions in specific shipping sectors. Granted, we may not see early adoption of methanol on tramping bulkers or large tankers, but as the marine fuel market moves from a spot business to one defined more by long term supply with respect to some fuels with lower availability, it becomes more attractive. Short sea shipping, ferries, inland waterways and workboats – all sectors that have flirted with LNG as a fuel – are all potential markets for methanol. The environmental argument is irrefutable: unlike LNG which only solves the SOx/NOx emissions problem, methanol offers a future pathway to a zero carbon emissions profile, so makes no contribution to global warming in addition to being compliant in terms of SOx and NOx. Several existing plants are already producing low-carbon methanol through a carbon capture/re-injection production loop. Methanol production offers a wide range of feedstock and process technologies for future proof, zero-carbon marine fuels. Biomass, like municipal solid waste and forestry residues can be gasified to produce methanol, while biomethane captured from landfill or wastewater treatment plants can be turned into methanol. Renewable electricity from wind, solar, geothermal and hydropower plants along with waste CO2 and even atmospheric CO2 can be used as the building blocks for renewable methanol or ‘e-fuels’ production. As a low flashpoint fuel, Methanol is subject to the revision of the IGF Code and should have full regulatory approval by 2023. Equipment manufacturers have responded, with engine maker MAN Diesel & Turbo investing substantially in a dual fuel, main engine capable of burning a range of low sulfur fuels efficiently and safely, with an impressive emissions scorecard to date for seven vessels already running on Methanol (with four more on order). Chevron Marine Lubricants has developed a range of cylinder lubricant oils designed especially for dual fuel engines burning low sulfur fuels such as Methanol. To generate a like-for-like comparison of the costs of methanol versus LNG or LSFO, the industry still requires a better means of pricing than the current link to the IMPCA petrochemical benchmark. To do this, the Methanol Institute has been working with Lloyd’s Register to develop a fuel comparison model, which will soon be officially launched as an online calculator available free of charge to the industry, enabling owners and operators to understand the comparative fuel costs associated with HFO, LSFO, and LNG, versus operating methanol-based propulsion. Using the calculator, potential users of methanol can examine the opportunity in detail, including by type and size of ship, by geographic region or trading area. The 2020 deadline is focusing minds on the short term, but it is clear that the marine fuels market will not escape disruption in the longer term too. Methanol may not be the fuel of the masses by 2020, but it could be the marine fuel of choice for a broad category of vessels through the remainder of the century and beyond – especially for those spending the majority of their time within ECAs. Owners who are able to think beyond the next few years to the next phase of regulation should be considering what the marine fuel market will look like, and how alternatives such as methanol fit into that future.